As an environmental lawyer with vocational zeal, every opportunity to travel and see new places triggers a fascination with environmental policy. During a recent trip to Mendoza, Argentina, issues related to water rights were front and center. 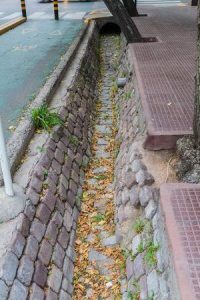 You could literally trip over the issue, because most sidewalks have irrigation ditches or “acequias” on the curbs and sidewalks to transport water throughout the region. Though Mendoza sits on the very arid eastern leeward side of the Andes Mountains, the regional planners conceived a complex web of irrigation channels designed to bring fresh Andean snowmelt into the city, agricultural lands, and now the sprawling suburbs. As with many of our environmental law projects, some of the most important work is performed by engineers. 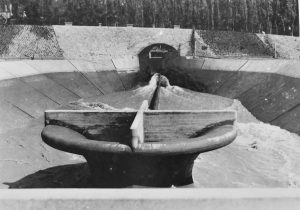 In 1889, the government of Mendoza recruited an Italian engineer, César Cippoletti, to improve the region’s hydrologic system. Cippoletti designed and supervised the construction of a dam to hold water from the Mendoza River and redirect the flow of the mountain run-off in the river through a series of directional canals. 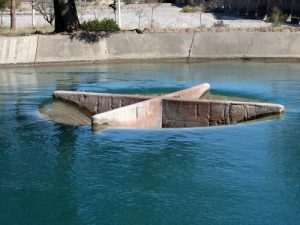 Just past the dam, one of the simplistic, yet elegant, structures designed by Cippoletti is a four-quadrant inverted cone. As the dammed water rises above the lip of the structure, it is channeled into one of four curved funnels. The water descends through the curved quadrants, gathering speed and direction toward different parts of the Mendocino irrigation system. With this complex irrigation infrastructure, the arid region boasts a cornucopia of agricultural riches, including large potato, garlic, tomato, and butternut squash farms. But the true pride of Mendoza, is its burgeoning wine industry. 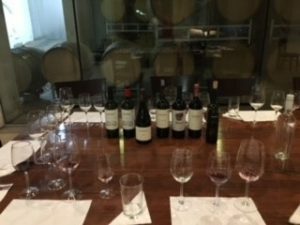 High-quality wines provide a fantastic export crop with an accompanying economic boom for agro-tourism in Mendoza and the vineyards in the neighboring Uco Valley. The arid conditions and well-developed irrigation systems are excellent for controlling the grapes’ exposure to water. In addition to regulating water, the daily temperature variations in the region have beneficial influences on the growth of a robust skin on the grapes. The grape skin is a primary driver of flavor and color in the wine-making process. Thus, these strong-skinned grapes of the Uco Valley provide good ingredients for bold wines, including Malbec, which is the primary driver of the region’s reputation. For all of the ingenuity and planning for the advanced irrigation system, water is still a finite resource in the region. Overtaxing the system could lead to dramatic impacts for all users. To preserve and protect the region’s water resource, Argentina developed a comprehensive nation-wide regulatory scheme. Argentina adopted a Water Law in 1916, which is similar to Massachusetts’ Water Management Act(“WMA”). The Argentinian law grandfathered existing users through a system which is similar to WMA Registrations. Argentina’s Water Law accommodated new users with licenses that operate like permits in Massachusetts. Just as the Massachusetts Department of Environmental Protection (“MassDEP”) oversees water withdrawals from the various river basins in the Commonwealth, the water management system in Argentina is administered by the Departamento General de Irrigación (DGI). The DGI approves and regulates irrigation licenses, oversees allocations among historic surface water users, regulates temporary projects or discharges, and evaluates and authorizes proposed new users. This legal structure in Argentina is very similar to the modern WMA in Massachusetts, which centralizes the administration of water rights in the professional staff of the MassDEP, rather than be subject to the whims of the political actors in the State Legislature. Like Argentina’s 1916 Water Law, the WMA creates tiers of rights between active users, at the time the law was adopted, and new users, who came on-line following the statutory observation period for registrations from 1981 through 1985. Different sections of the WMA – and the corresponding regulatory section of 310 CMR 36.00 – establish different requirements for registrations and permits, which are grounded in the WMA’s statutory purpose of protecting and preserving the Commonwealth’s precious water resources. While agriculture, industry and residential development can flourish side-by-side when resources are abundant, there are tensions between users when scarcity occurs. 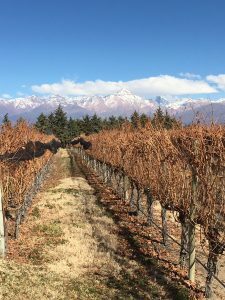 Even with their well-developed infrastructure and generally plentiful mountain run-off, the Mendoza region still experiences drought and supply problems. The authorities simply cannot approve all proposed projects. 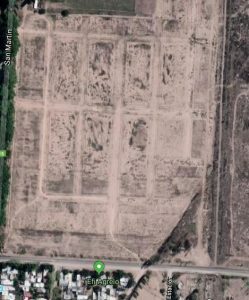 During our time in Mendoza, we observed a planned housing development in an advantageous location near a major arterial highway that stood fallow. Though the developer began designating internal roadways and had launched a marketing effort for new homes on the outskirts of the metropolitan area, the entire project was abandoned, because the water authority did not approve an extension of the canal system to provide water to this location. There are no potential alternate water sources. Thus, without access to the regional water distribution channels, the project was doomed. The development’s abandoned footprint sits like the shadow of a ghost town that never was, and serves as a stark warning of the perils of stretching a limited resource. Water allocation in Massachusetts is not nearly as dire. Unlike Mendoza, Argentina, or even many communities in the Western United States, Massachusetts enjoys a temperate climate. Water management issues in the Commonwealth do not occur against a backdrop of desert conditions. And yet, drought conditions can occur and strain a community’s ability to keep water in the taps – for industrial, agricultural, and residential users. Additionally, the forces of impending climate change are not linear or neatly predictable. Some models forecast the climate of Massachusetts as being very wet, but there are also predictions of more pronounced swings between periods of plentiful rain and extended periods of drought. Against this backdrop, managing our water resources in times of relative abundance may influence how successful we are in navigating periods of water scarcity. While Massachusetts is currently experiencing an uptick in residential and industrial development, proper planning and water needs forecasting must be part of the statewide effort to ensure there are adequate resources to support public water supplies, agricultural activity, and natural ecosystems. Like Argentina’s DGI, which has authority over irrigation licenses and can preserve resources for existing uses and ensure the system is not overtaxed, MassDEP has the power within the structure of the WMA to exercise informed professional discretion to protect our public water supplies, provide flexibility for emerging industrial needs, and preserve our shared natural resources. Though it may create some harsh outcomes – like the abandoned housing complex outside Mendoza, MassDEP also needs to be able to say “No” when users seek to over-exploit a resource. With the WMA, Massachusetts has a strong statewide regulatory structure to provide stewardship and achieve a fine balance among residential, industrial, and agricultural users on a watershed basis. On September 26, the Department of Public Utilities issued an Order providing for utilities to pay direct incentives to owners of new solar generating sources under the Solar Massachusetts Renewable Target (SMART) program. On September 17, Massachusetts rolled out its first-in-the-nation 2018 State Hazard Mitigation and Climate Adaptation Plan which integrates climate change impacts and adaptation strategies with hazard mitigation planning. The Plan qualifies the state for Stafford Act funds (per FEMA hazard mitigation grant criteria at 44 CFR § 201.4) and also complies with Executive Order 569. The state will update the plan every five years, with continuous reviews, updates and revisions via the new Climate Change Clearinghouse. To date, over 150 communities have performed vulnerability assessments and developed action-oriented resiliency plans under the Commonwealth’s Municipal Vulnerability Preparedness Program (MVP). Certified MVP communities are eligible for MVP Action grant funding and other opportunities. On September 4, the Supreme Judicial Court handed down New England Power Generators Association, Inc. v. Department of Environmental Protection rejecting the Power Generator’s challenge to MassDEP regulations requiring decreases in annual GHG emissions under the Global Warming Solutions Act (GWSA). Deferring to MassDEP’s interpretation of the Act, the Court ruled that the Department had the authority to impose annual declining emissions on the electric sector under Section 3 d of the Act, despite the existence of provisions in Section 3 c of the Act, which are specifically applicable to electric generating facilities. On August 21, Governor Baker signed the $2.4B Environmental Bond Bill including provisions that put into law his 2016 Executive Order 569, establishing an integrated strategy for climate change adaptation discussed above. On July 12, the EPA and Army Corps issued a Supplemental Notice of Proposed Rulemaking on their proposal to roll back the Obama-Era Waters of the United States (WOTUS) Rule defining the agencies’ Clean Water Act jurisdiction. The comment period ended on August 23, 2018. Whatever the agencies ultimately decide, ongoing litigation is sure to continue to delay the clarity sought by so many in the regulated community over the breadth of the agencies’ jurisdiction. In addition to EPA’s April 2018 proposed Strengthening Transparency in Regulatory Science rule, which would limit the scientific studies that the EPA could rely upon in evaluating new regulations, on June 13 the Agency issued an Advanced Notice of Proposed Rulemaking to change the methodology used to calculate the cost and benefit of new environmental regulations. Battle lines are being drawn over whether the EPA should continue to count so-called “co-benefits,” which take into account the indirect health benefits in addition to the direct benefits of a proposed new regulation. For example, in the case of the mercury air toxic rule, the EPA included $4-6M of direct health benefits from reduced mercury exposures and $80B in co-benefits attributable to the reduction of other pollutants, primarily particulate matter (PM). In March, MassDEP promulgated a package of amendments to its air pollution control regulations at 310 CMR 7.00 across a wide array of topics, including a revamp of the rules governing appeals of air plan approvals, which had long been the source of legal uncertainty and litigation. 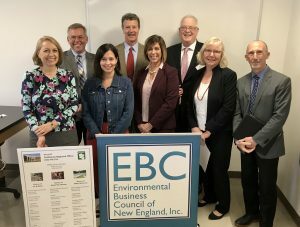 John Shea again moderated the annual EBC Program Series with MassDEP Leadership: Commissioner Marty Suuberg and the Southeast Region Leadership Team. At the October 2, 2018 program, John introduced and questioned pinch-hitting Deputy Commissioner Gary Moran, Regional Director Millie Garcia-Serrano, and Deputy Regional Directors David Johnston, Gerard Martin, Maria Pinaud and Jennifer Viverios. Gary announced that MassDEP is working with the UMasss Donahue Institute on short- and long-term succession planning since the average age of the 660 agency personnel is 55, with 54% eligible for retirement; the challenges being how to preserve institutional knowledge and hire bright, young environmental professionals. Dave Johnston highlighted the critical need to repair and replace failing water distribution and wastewater infrastructure. 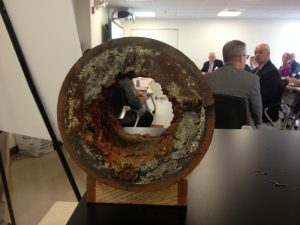 He punctuated his warning by displaying a section of a corroded and narrowing water line that is causing dirty drinking water and pipe failures in many municipalities. Tom Mackie and Gretchen Carey of Republic Services co-chaired the EBC Solid Waste Committee’s July 20 Innovative Alternative Technologies to Manage Municipal Solid Waste program. The international panel from Denmark, Great Britain, Australia and the Netherlands presented technologies from around the world, ranging from enzymatic separation to advanced gasification. On September 18th, Tom chaired the third annual EBC Solid Waste Committee meeting with the MassDEP Regional Solid Waste Section Chiefs. Greg Cooper, the MassDEP Solid Waste Division Director, provided an overview. Mark Dakers (SERO), Mark Fairbrother (NERO), Dan Hall (WRO) and Jim McQuade (CERO) provided updates on their regional priorities, permits issued and changes in their departments to a packed room of solid waste industry officials and consultants. 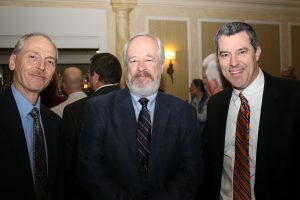 Peter Durning attended several industry events this fall, including the Boston Bar Association’s Annual Meeting in September, the LSPA’s 25th Anniversary event at Mechanics Hall in Worcester, as well as the Massachusetts Water Works Association’s Annual Meeting in Devens, MA. 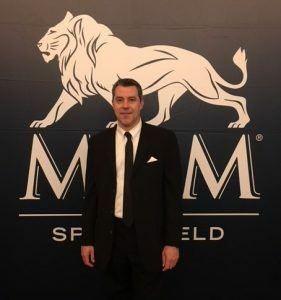 Peter also had the opportunity to attend the VIP-Preview Night for the Grand Opening of the MGM Springfield casino. Peter and Tom represented MGM in a zoning litigation matter in the Land Court. 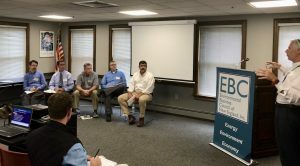 Peter Durning and John Shea participated in the EBC Program Series with MassDEP Leadership: Commissioner Suuberg and the Central Region Leadership team on September 25th. The most exciting news was the Brownfield redevelopment in Kelley Square and the Canal District for the proposed Polar Park, the future home of the WOOSOX. In addition to the ballpark, there will be hotels, shops, restaurants, and market rate housing. As summer closed, we took a family vacation to Oregon. In addition to lingering in Powell’s Books, eating from food trucks, and drinking local brews and Stumptown Coffee during several days in Portland, we borrowed a friend’s car for excursions to Cannon Beach and the Columbia River Gorge. As part of our family goal to someday visit all 50 states, we made sure to cross into Washington. 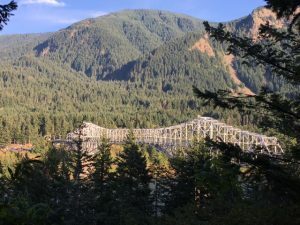 We grabbed that extra state with a dramatic pedestrian crossing over the Bridge of the Gods, which serves as the Columbia River crossing on the Pacific Crest Trail. After a restful and restorative trip, I returned to work after Labor Day, as news of the Eagle Creek Fire along the Oregon/Washington border brought the reality of Western wildfires to a personal level. 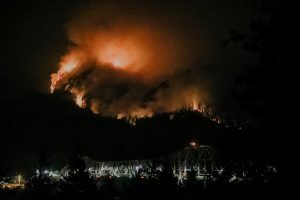 With visions of our triumphal Columbia River crossing still fresh, it was harrowing to learn of the breadth and rapid spread of the Eagle Creek Fire, which allegedly was started with a discarded firework. Careless fireworks are always a risk, but in the tinder box of the exceedingly dry Pacific Northwest forests this summer, this act of carelessness devastated over 50,000 acres. Is There a Liability Exemption for Emerging Contaminants Under G.L. c. 21E; and Oh, Gosh, Do I Need to Notify the DEP If I Find Them? As you are surely by now aware, the federal and most state governments have recently begun to regulate several new classes of chemicals, including Per- and Poly-Fluoroalkyl Substances (“PFAS”). Regulators have also lowered the concentrations at which certain chemicals historically listed as hazardous materials/substances are considered to pose a risk, such as 1, 4 dioxane and TCE. Last spring, I authored MassDEP’s TCE Closed Site Review: The Legalities which concluded that a landowner of a permanently closed TCE site revisited by the MassDEP should be entitled to the liability exemption under G.L. c. 21E, §5C even though the MCP purports to require further response actions. What my article did not discuss is whether the liability exemption under Section 5C of G.L. c. 21E would protect such an “eligible” owner from liability for an emerging contaminant that is first discovered and first considered to be a hazardous material like PFAS after the site achieved a permanent solution. Likewise, my article did not address whether such an owner would have to report its knowledge of the presence of such contaminants to the MassDEP. I conclude that because of the narrow language of Section 5C those owners should be prepared to address emerging contaminants under the MCP and c. 21E or risk liability to the MassDEP and they must notify the MassDEP if the concentrations pose or could pose an imminent hazard. Section 5C of c. 21E states that “an eligible person shall be exempt from liability . . . pursuant to this chapter . . . for any release of oil or hazardous material at the site or portion of a site owned or operated by said eligible person, as delineated in a waste site cleanup activity opinion, for which a permanent solution or remedy operation status exists and is maintained or has been achieved and maintained in accordance with such opinion . . .” For the liability exemption to apply, the “permanent solution or remedy operation status” and the “waste site cleanup activity opinion” must exist and be maintained for “any release of oil or hazardous material at the site.” The statute does not appear to exempt the owner from liability from the entire site but only exempts the owner from liability “for any release of oil or hazardous material” for which a permanent solution or remedy operation status exists and is maintained. Whether the Legislature’s reference to “any release of oil or hazardous material at the site” is broad enough to exempt the owner from liability for releases of hazardous materials that were not actionable at the time the permanent solution or remedy operation status were filed or only those that were actually assessed is unclear. Heavy emphasis on “any” hazardous material would support the application of the exemption. A more narrow reading (which is ordinarily applied by the courts in reviewing public health and safety legislation) would only exempt the owner from liability for releases of oil and those hazardous materials that were actually assessed as part of a waste site cleanup activity opinion in support of the permanent solution or remedy operation status. This differs from the case of a reopened TCE site because a permanent solution or remedy operation status “exists and is maintained” for “the release of oil or hazardous material [i.e. TCE] at the site” in accordance with the waste site cleanup activity opinion. The same legal framework and analysis for the lowered action levels for TCE should apply equally to contaminants such as 1,4 dioxane, that have historically been listed by the MassDEP as hazardous materials but have recently been assigned much lower action levels. Both must be properly addressed as part of the LSP Opinion. material including but not limited to, any material, in whatever form, which, because of its quantity, concentration, chemical, corrosive, flammable, reactive, toxic, infectious or radioactive characteristics, either separately or in combination with any substance or substances, constitutes a present or potential threat to human health, safety, welfare, or to the environment, when improperly stored, treated, transported, disposed of, used, or otherwise managed. The term shall not include oil. The term shall also include all those substances which are included under 42 USC Sec. 9601(14), but it is not limited to those substances. Under this broad definition, PFAS are hazardous material because of their toxicity. Any owner or operator of a site or vessel, and any person otherwise described in paragraph (a) of section 5, . . ., as soon as he has knowledge of a release or threat of release of oil or hazardous material, shall immediately notify the department thereof. Without diving into the numerous and complex exceptions to notification, generally under 310 CMR 40.0311, notification is only required for a release or threat of release of a hazardous material for which MassDEP has promulgated either a Reportable Quantity or Reportable Concentration or if the hazardous material exhibits one or more of the characteristics of hazardousness at 310 CMR 40.0347 (ignitability, corrosively, reactivity, toxicity, or infectiousness). Because MassDEP has not promulgated Reportable Quantities or Concentrations for PFAS (and they are not characteristically hazardous), mere detection of PFAS does not require notification. However, two hour notification is required if the PFAS “poses or could pose an imminent hazard.” 310 CMR 40.0311(7). An “imminent hazard” is defined in relevant part as “a release to the environment of oil and/or hazardous material which poses a significant risk to human health when present for even a short period of time, as specified in 310 CMR 40.0950.” 310 CMR 40.0321 (1)(d). 310 CMR 40.0950 requires that a Method 3 risk assessment method shall be performed to determine if an imminent hazard to human health exists. A Method 3 risk assessment includes use of Reference Doses and Reference Concentrations for toxicity and Carcinogenic Slope Factors and Unit Risk Values for cancer risk. According to MassDEP’s Draft Fact Sheet Guidance on Sampling for PFCs, the USEPA has established a Reference Dose of 0.00002 mg/kg/day, documented in the Drinking Water Health Advisory, which would serve as the basis of a MCP Risk Characterization. In conclusion, eligible persons who own sites where emerging contaminants are discovered are not exempt from liability or notification of the detection of such contaminants. If there are no promulgated RCs or RQs for the contaminant, a Method 3 risk assessment will be required to determine if an imminent hazard exists and notification is required. In that case, 2 hour notice is required. If an imminent hazard exists, the responsible party will need to notify and perform an immediate response action and follow on MCP assessment and possible remediation. Even if no notification is required, the responsible party is required under the MCP to carry out response actions and is not exempt from liability to the MassDEP for failure to take such actions. When I first started to dive into this dense analysis (apologies to the reader), I experienced cognitive dissonance. I simply could not get my mind around the concept that decades old closed sites could present a whole new set of engineering, legal and financial problems. I felt like Marty McFly in Back to the Future. Although CERCLA has statutory “reopeners,” that concept seems foreign to the Massachusetts site clean up arena under the MCP and c. 21E. Not until I read the EPA’s Health Advisory on PFOA, did the potential public health risks start to sink in and my head clear. I am not sure that the liability framework under CERCLA and c. 21E is the best means to address emerging contaminants. Aside from creating cognitive dissonance, I wonder if it is fair (as if CERCLA and 21E were ever fair) at this time, to require somewhat remote parties (i.e. people other than manufacturers who released these chemicals to the environment) to be legally responsible for exceedingly low concentrations of ubiquitous chemicals that were in the stream of commerce as products, and had nothing to do with waste disposal decisions. Regardless, for now, LSPs, responsible parties and their non-environmental counsel need to clear the mental fog and take their reporting and response obligations for emerging contaminants seriously – – at least until we invent a better mouse trap. For if this is just the beginning of a much bigger long-term trend, I fear that the existing “polluter pays” approach will not be workable. It certainly stands to reason that the MassDEP’s duty to protect public health, welfare, and the environment, encompasses the authority to require responsible parties to take necessary and appropriate response actions at sites where newly understood hazards exist, even though former science might have justified regulatory closure. But how can that basic principle be reconciled with our general understanding that a permanent solution provides a “liability endpoint” for a responsible party? The 2006 brownfields amendments, codified in Section 5C of chapter 21E, provide a liability endpoint for persons who properly perform MCP response actions to completion. Specifically, under Section 5C (a) “an eligible person shall be exempt from liability . . . pursuant to this chapter . . . for any release of oil or hazardous material at the site or portion of a site owned or operated by said eligible person, as delineated in a waste site cleanup activity opinion, for which a permanent solution or remedy operation status exists and is maintained or has been achieved and maintained in accordance with such opinion . . .” Permanent solutions are achieved under Section 3A of the statute by achieving a level of no significant risk at a site. The import of these sections taken together is that a person’s liability ends if his or her site poses “no significant risk” such that a “permanent solution” has been achieved and maintained. So if an eligible party reaches a condition of no significant risk, achieves such a permanent solution and is statutorily “exempt from liability,” how can the MassDEP require that same person to later take further response actions (absent an audit finding or other violation of the MCP)? Is there something in the statute or Massachusetts Contingency Plan that provides the MassDEP with a reopener if science reveals that the level of TCE once considered no significant risk, is later determined to pose a significant risk? Since the definition of “permanent solution” depends upon a determination of whether or not a significant risk exists based upon “existing public health or environmental standards,” it seems quite clear that the legislature intended to provide an exemption from liability under c. 21E to persons if they properly rely upon “existing” standards, and to protect them against reopening of liability based upon new standards that may be adopted by later regulatory changes. Does the MCP contain a backdoor mechanism whereby closed sites must be reopened by responsible parties who would otherwise be exempt from liability because they properly achieved a permanent solution? 40.0137 of the MCP requires a new release notification for an already closed site (and therefore, reopening of a site) under the following circumstances: (1) changes in activities, uses or exposures at the disposal site; or (2) the presence of such oil and/or hazardous material would negate or change prior risk determinations or statements were that presence taken into account in the preparation of the permanent solution. Neither of these two provisions for new notification appears to apply based merely upon promulgation of a new standard. The first only requires notification at a closed site if the exposure scenario changes. Under the second, the promulgation of a later lower risk based standard would not “negate or change the determinations or statements” in the permanent solution because the known concentrations met the existing risk based standard when the permanent solution (or RAO) was filed. There is no other MCP provision that expressly requires a responsible party to give notice or take response actions merely as a result of a later published risk threshold. Unfortunately, the MassDEP takes the position that even though notification and compliance with the MCP may not be required for some sites, “under 310 CMR 40.0370 appropriate steps must be taken at these sites to eliminate or mitigate risks, if necessary, though these actions do not usually require notification to or approval by the Department.” 40.0370 provides that “(1) response actions shall be undertaken for releases or threats of release of oil and/or hazardous material that do not require notification under 310 CMR 40.0300 if the releases or threats of release pose a significant risk to health, safety, public welfare, or the environment, as described in 310 CMR 40.0900.” There is no time limit on this provision, i.e. it appears to be what my law professor called a “springing” provision, waiting to spring up when least expected. 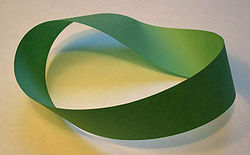 Thus, read literally, the MCP is a Möbius loop. Despite the statute’s liability endpoint, under the MCP “once a disposal site, always a disposal site.” Like the tar baby, under the MCP a site owner will never be able to shake off the label and attendant potential exposure. In this space in the August 2016 Newsletter, we heralded Governor Baker and MassDEP’s efforts to secure from EPA delegation to administer the National Pollution Discharge Elimination System (NPDES). Proposed legislation was sent to die in study at the end of 2016 legislative season by the Joint Committee on Environment, Natural Resources and Agriculture. On March 8, 2017, Governor Baker filed An Act to Enable the Commonwealth’s Administration of the Massachusetts Pollutant Discharge Elimination System that will allow MassDEP to administer the NPDES program as in 46 other states. The legislation will make changes to the Massachusetts Clean Waters Act, which are required for MassDEP to apply to EPA. The Fiscal Year 2018 budget proposal includes a $1.4 million “seed” investment to support the NPDES program. The appropriation will increase to $4.7 million in FY 2019. The initial funding will allow MassDEP to hire 12 new staffers to phase-in NPDES program development and conduct water quality analyses. The Waterways regulations (310 CMR 9.00) protect public trust lands, including waterways and filled former tidelands. Recent amendments effective on March 10, 2017 explain the requirements for Facilities of Public Accommodations (“FPA”) to protect public rights and benefits of the transient public along the waterfront and water-dependent marine uses (fishing, boat repair, commercial passenger and shipping) in Designated Port Areas (“DPA”) from displacement by non-water dependent commercial, residential and recreation uses. Difficulties in securing long-term FPA uses (restaurants, retail stores, hotels, museums) on the ground floor of buildings on filled public and private tidelines, prompted amendments that now allow the substitution of Facilities of Limited Accommodation (“FLA”) (310 CMR 9.56). There are strict qualifying and design criteria, and payment of 20% of net operating income to fund waterfront activities. Future review is required to determine if a FPA can be supported. • GHG emissions from large power plants (23 existing and all new facilities). The regulations would increase “clean energy” (renewables and hydropower) from 16% in 2018 to 80% in 2050 provided by retail electricity providers, distributors, competitive suppliers and municipal light plants through the use of clean energy credits. MassDEP has proposed an omnibus package of air pollution control regulations at 310 CMR 7.00 that should be promulgated this Spring. The amendments cover applicability of Plan Approvals for GHG and CO2 at new and existing facilities; establish exemptions; and include updates to match EPA requirements for lead emissions, VOC RACT, NOx RACT, and a NOx Ozone Season budget. The proposed air regulations provide much needed timelines and procedures for requesting adjudicatory appeals of air decisions. Who has standing to appeal, and when and how to appeal air permits was the subject of several MassDEP adjudicatory hearing and Superior Court decisions. The regulations now define “aggrieved person.” The “date of issuance” is the date the decision is sent to the applicant. Importantly, a copy of the decision must be posted on the MassDEP’s website in order to notify people when the 21-day appeal period begins. Ten person groups have a right to request an adjudicatory hearing, provided they have submitted comments during the public comment period on a pending permit application for air emission sources that emit 10 tons or greater of regulated pollutants, and only on issues relating to damage of the environment.